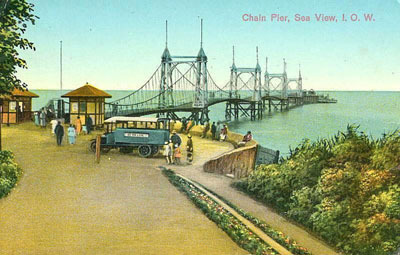 Seaview Pier was a suspension pier designed and largely built by Frank Caws, a Seaview-born engineer/architect then with an established practice in Sunderland. The pier was finished in 1881, and was 1000 feet long and 15 feet wide. There were four sets of towers from which the pier deck was suspended. Passenger steamers from Southsea and other south coast towns called at the pier during the summer. Further work was carried out on the pier in 1889, with a 50 foot extension and a new pier-head. The pier-head was further extended in 1901. Passenger services stopped during World War One, and restarted in 1920. The Pier was taken over by the Royal Navy during World War II, but with little maintenance being carried out in that period, it was in a poor state at the end of the war in 1945. It was subsequently sold at auction with various plans over the following years to either demolish or restore the structure. Finally it was decided to restore the pier and it was the first pier to be ‘listed’ under the Town & Country Planning Act. However, a series of storms between October 1950 and December 1951 severely damaged the structure, leaving only the pier-head and around 100 foot of the decking. It was the decided that it was impractical to restore the pier to its former glory and during 1952 the final remains were demolished.